Yes, you may have noticed, I have been re-visiting my favourite winter climbs near home. 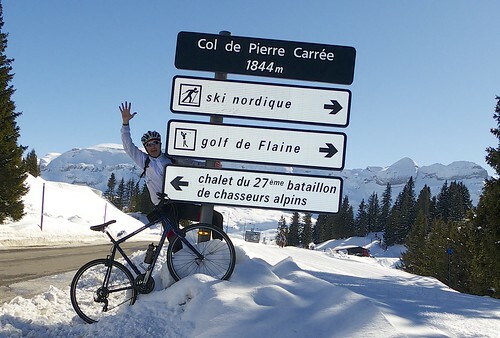 Col de Pierre Carrée, at 1844 metres, is the highest col anywhere near Geneva that is open all winter. I’ve often called this a great introductory big climb for those getting ready to attack the high Alps. At 21 kilometres, the climb is roughly the same length as French giants like Ventoux, Col de la Madeleine, and Col du Tourmalet. 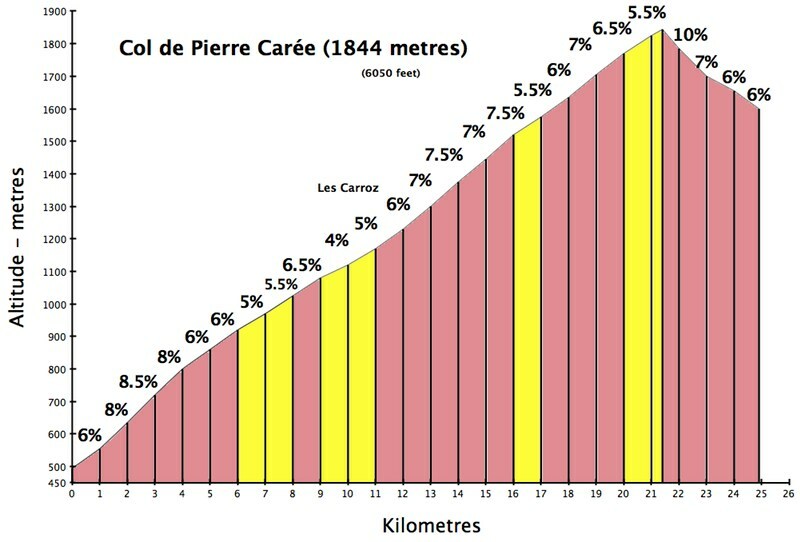 But Col de Pierre Carrée is roughly 1% less steep on average than the above. It’s a beautiful climb with plenty of fun hairpins. The first quarter of the climb is the steepest with a fun cliff stretch. The 2nd quarter is the least interesting as the route passes through a couple of villages. 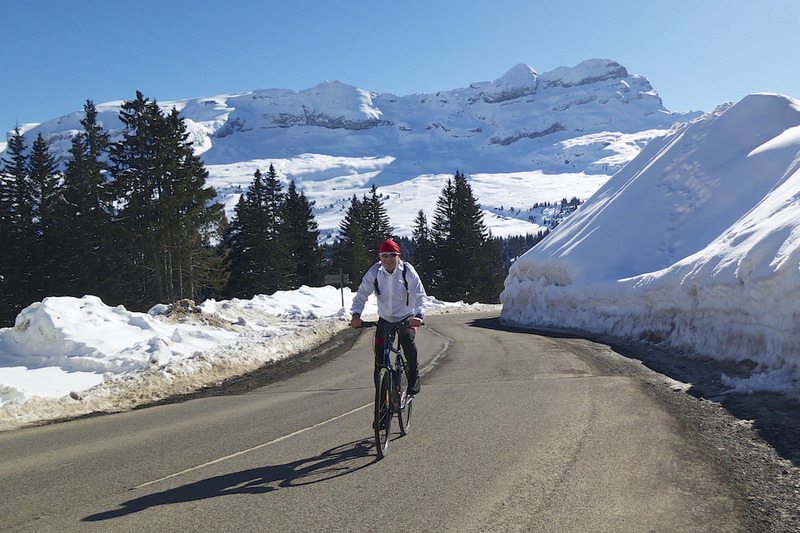 But at the half-way point, above Les Carroz, there is very little traffic for the rest of the way. 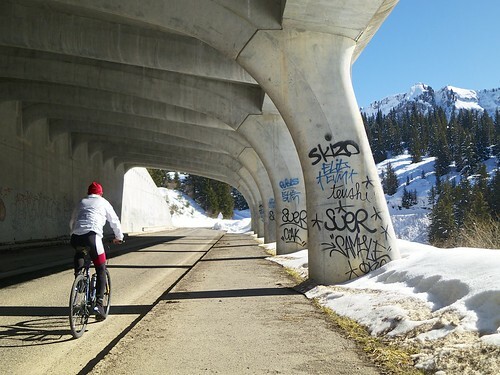 In fact, outside of the ski season, the road is usually deserted as Flaine shuts down completely once the skiing ends. The road was clear except for the last, highest, shaded kilometre. This was a touch tricky and icy so I was glad I had my hybrid. Remember, it is best to avoid this climb on Saturday’s during ski season as there will be quite a lot of traffic. From the Col the road descends roughly four kilometres to Flaine. Then it is a dead-end. It is a nice little climb, but this time I just stuck my nose over the top and took the photo at the top of this post. I try to stick to my plan of climbing Faucille this afternoon to shoot my first “bike in the snow – picture”. After all my XC outings at La Vattey I’m wondering how my legs will perform first time on the saddle. One more ride and you’ll have done 10% of your challenge already !